We picked the Pandem E30 body kit. Why? Because we thought it looked really cool, gave us the ability to run some wide wheel, and there wasnt too many of them around. Little did we know, that this kit is not meant to be functional at all. After getting the kit, we realized, this kit was meant for a car that was going to be parked on air at shows, not put fast lap times down at the track. Every builder who has used this kit on an e30 used it with air suspension for a reason. The wheel arches on this body kit are incredibly high. Meaning cutting the car very very very high. No big deal right? 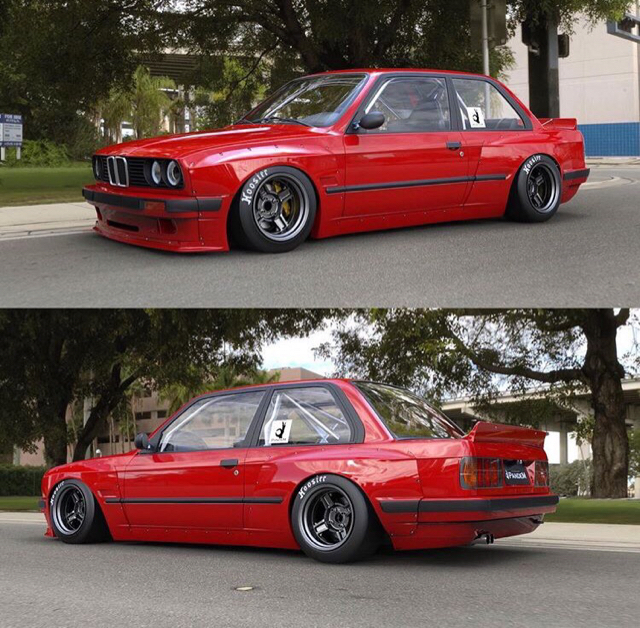 Ever notice how none of the E30s with the pandem kit have their wheels turned when they are slammed? Yea, thats because they cant turn at that ride height. It would touch the body kit. Thats why the wheels are always straight in the pictures. So we made a mistake. What were we going to do with this very expensive body kit or the custom wheels made for this car? Cut up the body kit? Not with a price tag that it had. However, with some serious chasis modification and creative thinking we came up with a solution. The first thing we had to do was cut the rear wheel arches. Very high. There was no going back now. It was like performing surgury and making sure there was enough “skin” to sow it back togther. We cut the outer skin and left the inner skin to use it to close up the new fender gap. The front was a little trickier. After realizing that the car wont be able to turn with 9.5 in wheels because it touched EVERYTHING. At the ride height the Pandem kit was expected to “look” right at, it would rub on the inner fender seem. So we cut it out and welded it shut. On turning it touched the wheel well corners (inside cabin). We had to cut a massive section out to get it to turn lock to lock. On the front the corner of the engine bay had to go for the same reason. Now being that the car was going to be so low to the ground, we would also need to make the whole front end removable very quickly. This would make it loading onto the trailer to get to track events/shows/etc a little easier. Its not like we could just air up the car at will. The car has a functional coilover system all the way around compliments of ground control. This includes true rear coilover rear setup like the old DTM cars had. We did mention we picked the wrong body kit right? We will explain how we made the front end removable here. All LS1 parts can be found at the Garagistic Store. We wanted to experiment with the aero on Ares. So the trunk wheel well had to go. We made a delete panel and removed the spare wheel well because the new diffuser system would then occupy the space that it use to be in. So we made a delete panel and modified it from our production version by adding a quick release system. This would give us an panel to be able to check on the differential and some rear suspension components when we needed to without needing the remove the diffuser setup. We want the diffuser system to run most of the length of the car. There would be a cut out for our M coupe diff cover to stick out from so it can do what it does best. Cool the diff. That meant that the exhaust would need to go somewhere else. We didnt like the idea of a side dump (and we didn’t want to kit our Pandem kit). So we decided to have a similar look to the DTM E30 cars and run it through the trunk. Why not? It runs through the spare wheel well delete and on either side of where the licence plate would go. It would be tucked away so it couldn’t get damaged and at the same time away from our diffuser setup. We then welded up the stock cutout panel because it would no longer be used. For all E30 LS1 parts visit us at Garagistic! The car was meant to be low. Very low. Very very low. And ride height was static via ground control coil-overs. That made the front valence very low. And we wanted to keep that way because we had some aero mods in store including a fully functional diffuser system. So what do we do? Loading it onto trailers would be an unthinkable task. We made the front end removable. We did this buy buying an OEM late model front valence and cutting it up. Yup. A brand new valence. We did this because it had to be perfectly straight. We practiced with a questionable unit and we knew what we had to do to make it removable. We had to make the OEM piece into 2 pieces. An upper half and a lower half. We would then make sure the upper piece stayed on the car as the original engineers had intended. But the lower half would come off with the bumper. We used the 2 stock bolt locations to run pins to be able to pull on to remove the bumper setup and the lower half of the valence in a couple seconds. That pair with the e30 removable core support, we would be able to service the car in a hurry if we needed to. Sticking with the modular theme, we wanted the steering system to be no different. Obviously we were going to go with a quicker steering setup over the school bus setup of the e30. That ended up being a Z3 rack. Paired with our steering rack conversion kit it bolted right up. For the outer tie rods we made adjustable versions that were a little lighter, beefier, offered more adjustment and allowed bump steer adjustment. These are made to order. Common use is for guys who use e46 lower control arms. For the steering column we went with our competition steering shaft. Its made from 2 e46 steering shafts. It is more compact which allows the LS1 headers to wrap around (and its still a tight fit). It also make the shaft much tighter feeling because it eliminates the stock rubber rag unit that disconnect the feeling of the road from the steering wheels. We then added AN conversion fittings so we can retain power steering and run lines to the LS1 power steering pump. More details to come! Garagistic is proud to announce we are entering the arena of brilliant minds and innovators all around the globe. We’re beginning our journey to the largest auto trade event in the world: SEMA. You read correctly. We will be joining industry leaders from around the world this coming November 2016. But we are not about to go empty handed. We have a treat for you guys; a project car that will be singularly the most ambitious stunt Garagistic has ever tackled. We have named it, Ares. Violence and control. The fury of war merged with military strategy. This is the embodiment of the offspring of Zeus and Hera. The power of American muscle and the poise of German engineering. This is the son of Olympus, Ares. Ares, Greek god of war, classically depicted. We’ve been dancing with V8s long enough now, and damn it we have it down to science. Besides that we have our high caliber specialty suspension we forge here in the shop. Combine these ingredients with a 1989 325i and it all comes together as a street legal, track ready, easy to build, easy to modify, weapon of a car. Corvette power in a lightweight BMW 3 series. These are our products. Everything you will see on Ares is either items we make that are currently in production or a custom piece built directly from am existing Garagistic piece. But don’t worry, there is nothing on Ares that would be unavailable to you. One of the objectives when we were conceiving the plans for Ares is to produce new performance parts that can be used in any application. Certainly we have a massive amount of work before us, however we’ve begun working on this already. Click here for a link to the completion map to see how far we’ve progressed, and keep following us for the next post where I will explain in detail how much we’ve already done to Ares and everything yet to complete. We have a long way to get to SEMA but as they, you never really finish you just run out of time.